Buy Highest Quality and Superior Fitting 2019 Camaro Stripes, 2019 Camaro Vinyl Graphics, 2019 Camaro Decals, and 2019 Camaro Stripe Kits for the 2019 2020 Camaro 1LS, 1LT, 2LT, 3LT, 1SS, 2SS, ZL1, Coupe and Convertible models. Specializing in Camaro Racing Stripes and Camaro Rally Stripe Kits, we also have Camaro vinyl kits for the hood, roof, trunk, spoiler, side door, lower rocker, rear fender and more! Don't you want the best quality for your vehicle? You purchased a $20k, $40k, or even $60,000 vehicle. Graphic kits purchased from a dealer parts department or retail outlet will easily cost you $500 - $1000, and then some! We offer the same premium factory quality Camaro vinyl stripe kits at the best prices possible! If you truly value your vehicle, then please accept a higher quality product by choosing a MoProAuto premium line Professional Design Series vinyl graphic! Professional OEM Quality Vinyl! We only offer Premium Automotive Cast Vinyl Films, featuring vinyl by either 3M, Avery, or Ritrama. These professional automotive grade vinyls are designed to last five to 12 years in vertical positions depending on the vinyl series purchased and post installation care given. Choose "Wet" or "Dry" Application Film! Choose a classic "wet" installation film featuring 3M Scotchcal High Performance Grade, Avery Supercast, or Ritrama cast vinyl films. For modern "Air Release Technology", choose a "dry" installation wrap film featuring 3M 1080 or Avery Supreme Wrap. Both options are available for a majority of our "Pro Design Series" vinyl graphic kits. Pro Styling and Perfect Fit! Vehicle specific vinyl graphic kits - precisely designed, measured, and professionally test fitted. Most of our vehicle specific vinyl graphic kits are expertly "cut to fit" by our professionals for the make, model, and year indicated. Installed by Automotive Chevy Dealers and Professional Installers first! Don't be fooled by imitators! Our "Pro Design Series" kits are tested fitted and sold to automotive dealerships and professional installers first, because precision and top-quality are demanded from these industry professionals. Only then do we allow these kits to be made available to the general public at special prices! Easy and Ready to Install Camaro Stripe Kits! Follow the included instructions or view one of our videos for detailed vinyl graphic installation information, or contact us for qualified professional vinyl graphic installers in your area! Fast and Free Shipping Available! Most Pro Design Series Vinyl Graphics are produced when ordered and ship within 24 hours. Order Now! Professional Quality Vinyl! We only offer 2019 Chevy Camaro Premium Automotive Cast Vinyl Films, featuring vinyl by either 3M, Avery, or Ritrama. These professional automotive grade vinyls are designed to last five to 12 years in vertical positions depending on the vinyl series purchased and post installation care given. Pro Styling and Perfect Fit! 2019 Chevy Camaro vehicle specific vinyl graphic kits - precisely designed, measured, and professionally test fitted. Most of our vehicle specific vinyl graphic kits are expertly "cut to fit" by our professionals for the make, model, and year indicated. Installed by Automotive Dealers and Professional Installers first! Don't be fooled by imitators! Our "Pro Design Series" kits are tested fitted and sold to Chevy automotive dealerships and professional installers first, because precision and top-quality are demanded from these industry professionals. Only then do we allow these 2019 Chevy Camaro stripe kits to be made available to the general public at special prices! Fast and Free Shipping Available! Most Pro Design Series 2019 Chevy Camaro Vinyl Graphics are produced when ordered and ship within 24 hours, with Free Shipping as an option. Order Now! NEW 2019 CHEVY CAMARO DECALS AND VINYL GRAPHIC DESIGNS RELEASED! 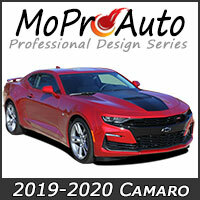 - For the 2019-2020 Chevy Camaro model years, you will find 4 new MoProAuto "Pro Design Series" vinyl graphic kits being made available to the general public. We design, test fit, and sell direct to automotive Chevy dealers and manufacturers first, before making them available on our website. This ensures a quality vinyl product is being sold to you! MoProAuto specializes in factory replicas of many "OEM style" vinyl graphics, stripe kits and decal packages, along with new designs that have a dealer-friendly, factory style. We only offer the highest quality Premium Cast Automotive Vinyl Striping available, from partners at 3M, Avery Dennison and more. Our 2019 Chevy Camaro vehicle specific vinyl graphic and decal kits have been precisely designed, measured, and test fitted to replicate "Factory OEM Style" vinyl graphic kits for the most professional job possible. We provide these vinyl stripe kits to professional restylers and automotive dealerships across the country and around the world. If you truly value your vehicle, then please accept a higher quality product by choosing a MoProAuto premium line Professional Design Series vinyl graphic! Order today!